A double-decker, authentic paddle wheel patriotically painted in Red, White and Blue! 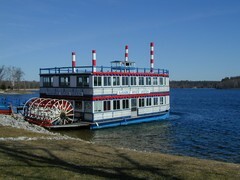 The Au Sable River Queen is a top attraction and the only paddlewheel river boat operating in northern Michigan. Two-hour excursions offer a view of wildlife and beautiful scenery and you can relax as the captain narrates this area's colorful history. It is a popular fall color destination, requiring reservations for weekend trips. The Au Sable River Queen is accessible with a heated lower deck, snack bar, and onboard restroom facilities. It accommodates tour bus groups and can be reserved for wedding receptions or other special occasions.